SNUGPAK a long story! – "Danilo Amelotti"
It was the winter 1995 when I first entered Sarajevo (Bosnia). We were few SPECOPS teams, covering and protecting the Italian Contingent, entering in that devastated area of the world. We had many thoughts, wonders, problems and of course, possible enemies. The first difficulty was dealing with the weather. Probably for some of you, the previous sentence might sound weird or inappropriate when talking about war condition and tactical contest, but I am sure that most of you, who have been in such conditions, will immediately understand why I wrote a statement like that… the temperature was between -15 and -25 Celsius (5 -13 Fahrenheit), snow and ice where covering any singular thing around us (included minefields, booby-trap etc) and being on an open vehicle or on a Counter-sniper position was quite demanding, especially when these tasks last more than a day!! To be honest, I must admit that the Italian Army was not as well equipped as it is today, and our winter clothing where not the warmest ever, especially considering that our tasks and operations where forcing us to move lightly and quickly. It was during one of the worst day (speaking about cold exposure), I was frozen cold during one of our many SR (Special Recognitions) into the Serbian Territory, I noticed that a colleague of mine was not as cold as I was… actually he was smiling and seemed not to be affected by cold as all the rest of the team. He was wearing a funny green Puffy Jacket! Only at the end of that day, when we finished our SR I was able to ask him what kind of Jacket was that one.. He replied to me with a name that sounded quite funny… Sleeka jacket from Snugpak! Well, it took several weeks before I was finally able to get one (shipped to me by my ex wife) and finally appreciate the great qualities of that “puffy Jacket”. Since that day, 19 years have gone by. Within this window of time, the Italian army started to released us special equipment that finally were and still are tailored for our missions, but that particular jacket remained one of my favorites, to the point that although many different one have been issued by the army, that one is still the basic part of my equipment. Last summer, during the Outdoor expo held in Friedrichshafen (Germany) I finally got the chance to meet in person the responsible managers of Snugpak; while talking to them, I have been so glad to thank them for that great products, and I described some of the rough moments in which I greatly appreciated and experienced the quality and durability of it. Following the meeting, they decided to provide me with the latest model produced ed, mentioning it’s great improvement compared to the original one (still under production) the SJ -9. In order of not being too much in favor of this Jacket, I took quite long time to test it in all possible conditions and situations, to be able to provide our readers with an honest fair and complete test. I therefore provide a test to the SJ -9 A-TA CS Color, on temperature between +12° and -15° Celsius (53.6 / 5.0 Fahrenheit) and weather conditions from sunny to snowstorm and rain. The whole range is manufactured the Snugpak West Yorkshire factory, quilted on their state of the art machinery and hand-assembled by their skilled sewing staff. so you stay warm, comfortable and dry. Furthermore the Softie Premier filling reflects and traps heat for reliable dryness, warmth and comfort every time you wear it. By the way, the SJ -9 is not the warmest jacket on the market. Some people use this jacket only as city out wear, although this could be seen as a weakness, the choice of not wanting to be extra-warm derives probably from the intent to have a perfect garment for military and civilians that need to work and move in cold weather. Having a jacket too-warm, could be the cause of excessive sweating while working and moving, therefore might be uncomfortable when in pause or in a long period of time. In fact, every person who works and operates in cold environment knows that sweating is never a good things, but often the physical activity is not so intense to demand a very light dressing, therefore requiring a jacket or something that can work both during movement or when in a steady position. With SJ -9, I experience the ability to work, walk and / or remain in the open field without moving, however, maintaining a body temperature extremely comfortable and never sweating. 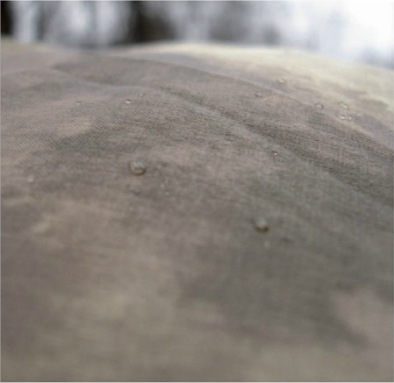 I can confirm that the Paratex works perfectly, maintaining also rain or snow on the outside part of the jacket, and providing an overall resistance to any stress-induced when walking in the wood-line or crawling in the snow/grass, or when carrying a rucksack. Moreover the water resistant Zip, although its small design, resulted to be really practical in its use, also when wearing gloves or when operating in low visibility. Although my first impression on the permanent hood (I initially considered it not really functional), I remain greatly impressed by its benefit. With its ability to be fully adjustable, it grants the necessary extra warmth around the head, neck and face. In fact, since the head (especially the neck) is the part of the body that mostly loose heat in cold environment the insulated permanent and adjustable hood allows a quick wearing when it comes the time to maintain the body temperature, or just fold it while working and move, allowing the extra heat produced by body to leave through the head (therefore reducing drastically the body over heat and sweating). 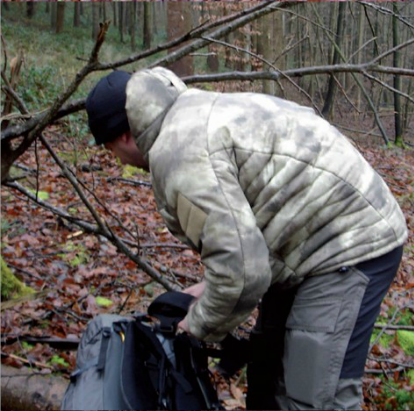 The SJ -9 is provided with three pockets, one internal at the jacket, and two external concealed; all of three pockets have enough space for anything you need to keep inside, and the “concealed feature” grant a very good insulation from water or anything else, granting to the person the ability to keep also paper or electronic devices (Maps, GPS, Mobile phone), without the risk to find them wet after a day in the rain. Differently from the original Sleeka Jacket, the SJ -9 new design is tailored to fit the contours of the body, which improves the fit.